Dr. Laurie Santos is a Professor of Psychology and Director of the Comparative Cognition Laboratory at Yale University. She received her B.A. in Psychology and Biology from Harvard and Radcliffe College, and went on to complete her M.A. and Ph.D. in Psychology from Harvard University. Among Laurie’s many awards and honors, she has received the American Psychological Association’s Distinguished Scientific Award for Early Career Contributions to Psychology, the Lex Hixton Prize for Teaching Excellence in the Social Sciences, the Arthur Greer Memorial Prize for Outstanding Junior Faculty at Yale, the Stanton Prize from the Society for Philosophy and Psychology, and she has been named one of TIME Magazine’s “Leading Campus Celebrities”. Laurie and her research have been featured by The Today Show, BBC News, NPR News, NBC News, The New York Times, and many other media outlets. She is with us today to tell us all about her journey through life and science. During her time away from science, Laurie likes to enjoy nature through leisurely hikes. She is fascinated by celebrity autobiographies and memoirs, and Laurie is also fond of singing karaoke. As a psychologist specializing in comparative cognition, Laurie is interested in what makes humans special. She studies the cognitive abilities, strategies, and decision making process we use to see if any non-human species share these or whether they are uniquely human. Most of Laurie’s research has focused on primates, since they are our closest relatives; however, she recently began studying cognition in canines as well. Even though dogs aren’t as closely related, studying how they think is particularly interesting because they live closely with us in the same environment. Laurie has always been interested in human behavior and cognition. Her interest in pursuing a career in this research area started in college when she took her first psychology classes. The topics in class were really interesting, and Laurie hadn’t realized before that this was a field that she could study. In one comparative cognition class, Laurie had the opportunity to do field research observing behavior of macaque monkeys in the wild. After this experience, she knew this was what she wanted to do. A few years ago, Laurie had to go through the unfortunate process of retracting a published research paper. The student working on the project had made some major mistakes, and Laurie felt like she had failed as an advisor and as a scientist. It was an awful experience, but she was committed to correcting the scientific record as quickly as possible. Through this, Laurie learned some valuable lessons, and they have implemented processes to ensure it doesn’t happen again. Laurie just had the first paper from their canine research center accepted for publication. Her group discovered that, compared to humans, dogs are less susceptible to bad or irrelevant information from others. This was an interesting finding and a huge milestone because there were a lot of challenges transitioning from working with primates to canines. Recently, Laurie had the opportunity to travel to the island of Moorea in French Polynesia for research she is conducting on cleaner fish there. It was an incredibly beautiful place to visit. One of her other favorite research destinations is an island off the coast of Puerto Rico called Cayo Santiago. The island is home to about 1,000 free roaming Rhesus monkeys, and these monkeys are accustomed to having people around, so there are phenomenal opportunities to watch the monkeys behaving in their natural habitat. Elaborate Halloween celebrations have become a long-standing tradition in Laurie’s lab. They used to all carve pumpkins and give them to the monkeys as enrichment items. Now that the lab works more with canines, they host a doggy Halloween party where they invite the canine participants and their companions to dress up in costume and join in the fun. Laurie is also known for throwing fantastic themed Halloween parties outside the lab. Try to find the good in tough situations, and make the best of it. Even the stuff that you do badly can teach you about how to perform better. Don’t lose your curiosity and excitement for the stuff that you are studying. Research in Laurie’s lab explores the age-old question: what makes the human mind unique? She tests this question by studying the cognitive capacities of non-human animals. By comparing the cognitive abilities of non-human animals to those of humans, Laurie and her team can determine which domains of knowledge are unique to the human mind. At the Canine and Primate Laboratory (aka CapLab), she studies the origins of human cognition by focusing on two different groups of non-human animals. First, Laurie tests the phylogenetic origins of human cognition by studying our closest living evolutionary relatives, the non-human primates. By testing field-living non-human primates using methods from cognitive development, they are able to directly compare the capacities of non-linguistic primates with those of preverbal human infants. In addition, Laurie’s lab also tests the role of human experience by testing the non-human species that lives most closely with humans: the domesticated dog. By studying dog cognition and comparing it to that of other canids, we can explore the role of experience in a species built to pick up on human cues and training. 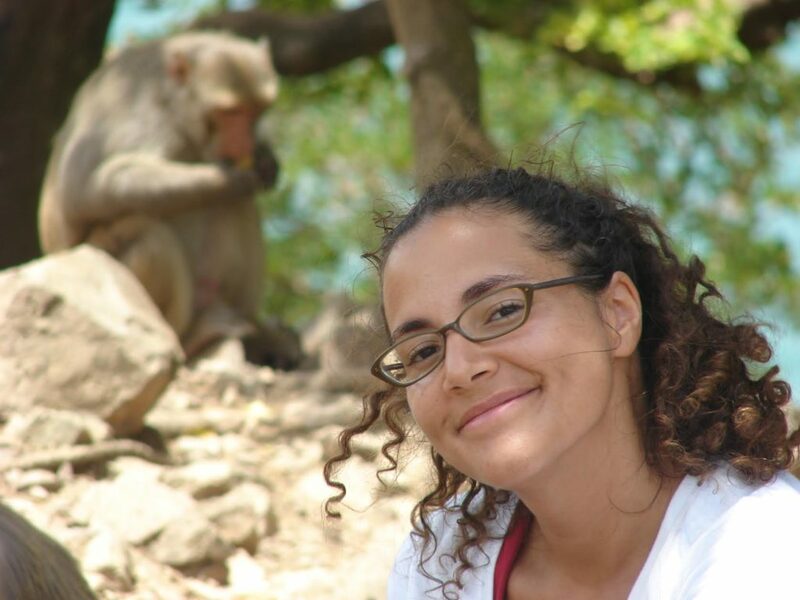 Some of her current projects explore whether non-human animals possess aspects of a human-like a theory of mind, the representations that dogs and non-human primates reason use to navigate cooperative and moral problems, the nature of human-unique constraints on pedagogy and social-learning in non-human animals, and whether other animals share human-like decision-making biases.